Shearwater Hotel & Spa has 7 dedicated meeting rooms including a spacious boardroom perfectly proportioned to cater for small, medium and large meetings. The Plaza Room is the largest of our meeting and banqueting facilities at Shearwater Hotel & Spa. Located on the ground floor of Shearwater Hotel’s business centre, it is a multi-functional space flooded with natural light by a superb glass wall leading out onto a private outdoor seating area. Features such as a self-contained pre-conferencing foyer with fully integrated AV equipment, make this the perfect choice for large conferencing events. The space is flexible and the room can be split into three separate meeting areas; Plaza, Plaza 1 & Plaza 2. It is ideal for receptions, weddings, banquets, meetings, press conferences, day and residential conferences and much more. The Dunlo Room is located on the first floor of Shearwater Hotel’s business centre. Dunlo is the perfect room for your meeting, seminar, board meeting, focus group session or presentation. Should you require a larger or smaller space for your function this room can split into a second syndicate room referred to as Dunlo 1 and Dunlo 2. The Kilconnell Room is located on the first floor of Shearwater Hotel’s business centre. This purpose built meeting room is ideal for small board meetings, training and interviews and is flooded by natural daylight. 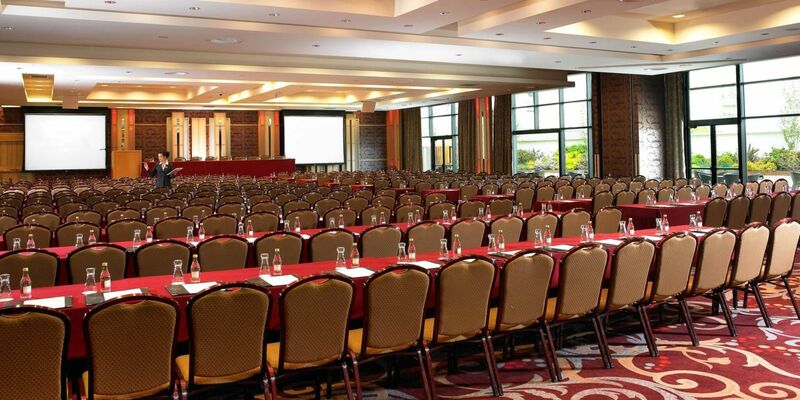 The Clonfert Room is located on the first floor of Shearwater Hotel’s business centre. This spacious room offers natural daylight. The décor is almost identical to the Dunlo and the perfect room for your meeting, seminar, board meeting, focus group session/presentation or intimate private function. The Garbally Room is located on the first floor of Shearwater Hotel’s business centre. It is a perfect syndicate room for large meetings and training events. The room is identical in style to the Dunlo Room and the Clonfert Room. Natural daylight makes the room bright and airy. The Aughrim Room is located on the first floor of Shearwater Hotel’s business centre. It is a perfect syndicate room for large meetings and training events. This room can be split into two spaces, if required. The room is identical in style to the Dunlo, Clonfert and Garbally Rooms. Natural daylight makes the room bright and airy. The Oranmore Boardroom is privately located in the Shearwater Hotel’s business centre and is an impressive boardroom for all meeting room requirements. Floor to ceiling glass windows ensure that daylight floods the space. The room has the best built in technical facilities in the area. Oranmore can seat 20 people boardroom style.